Fall is finally here! But would be a mistake to think that once we trade in our lawn mowers for leaf blowers that we are also finished thinking about our plant health needs. On the contrary, fall can be a critical time for fertilization and insect suppression. We can even take steps now to reduce the impact of this year’s leaf blight when spring rolls around next year so your tree can keep its leaves as long as possible. Leaf blight = all of the work of raking leaves without the benefit of the beautiful colors. From horticultural oil to soil-injected fertilizer to wooly adelgid, here is your complete guide to fall plant health care. For many people, the default approach to insect suppression is curative. This means that we get an urgent call indicating that a client’s tree is sick or doesn’t appear the way that it should. At that point, we are called in for a diagnostic visit or a consultation to see what’s going on and develop a treatment program to mitigate the plant stress. Sometimes, in curative situations, the problem might already be known – “I have bagworms” – and we are called out to treat the specific situation before irreparable damage is done to the plant. Once the situation is under control, we switch to a preventative strategy to prevent the problem from recurring or to identify and prevent new problems from developing in the first place. Preventative strategies rely on a combination of plant monitoring and pre-emptive actions that, in some cases, can be performed months ahead of potential threats. Our “Green Solutions Plant Health Care Program” acts as an early warning system of potential problems by putting a CVTS-L Plant Health Care Specialist on your property at strategic times throughout the growing season. If trouble is brewing, they’ll be there – in person – to recognize and neutralize the threat while minimizing the overall damage to your plants. These inspections are also a great opportunity for you to learn more about the plants on your property from our trained experts. Once you know what to expect from your plants, you will be able to better identify when something isn’t right. Fall is also an ideal time to take direct, preventative measures to ensure that your plants come back in their best shape next spring. While there are still situations that require a curative approach, the emphasis is on preventative solutions, suppression of known pest problems and treatments to promote good health and vigor of your plants. When we’re talking about fall preventative measures, we’re primarily talking about fertilization and insect suppression. Fall is an ideal time for fertilization with spring coming in as a close second. And this is one of the few areas where the rainy summer of 2018 can be beneficial. September and October are optimal times for fall fertilization depending on soil moisture. Generally, we don’t fertilize much in the summer because the soil is too dry and the roots can’t absorb the nutrients well. Some years we can apply soil-injected fertilizations in September and other years we have to wait until October. Needless to say, this year we’ve been fertilizing in September with great success. Fertilization is also a service that we can perform in the rain, so with Hurricane Florence coming up, we’ll probably be out fertilizing, and we’ll continue to fertilize up until November. The strategies vary by the target that is being suppressed and the variety and size of the tree. For example, we have a two-year trunk injection treatment that we can use to treat for emerald ash borer in larger ash trees, but for smaller trees we would probably recommend a soil injection (which only lasts one year). Fall (especially this fall) is an ideal time for soil injections – both for fertilization and suppression. Systemic soil injections can be used in the fall to suppress a host of insects in the spring including Hemlock Wooly Adelgid, Emerald Ash Borer, Aphids, Japanese Beetles and Scale Insects. In addition to our own growing list of certifications and accreditations, we study the latest materials and publications produced by Penn State University and the University of Maryland to ensure that we are as prepared as possible for each season. The universities are unbiased, objective research-based institutions that provide us with the tools to make sure we’re applying the right materials at the right time to get the best control possible. They can also help us identify trends and cycles to help us prepare in advance for insects that maybe we haven’t seen many of in this area for a few years or maybe is approaching this region from the south. Additionally, our unique location requires us to be able to address the insect suppression needs of both northern and southern species of plants. If you’re not sure where to begin with insect suppression, think of Pennsylvania’s state tree: The hemlock. Easily identified by its white “cotton ball” appearance on the twigs of your hemlock tree. The white is actually a covering over top of the insect itself. The white part will remain on the twig for some time after the insect has been killed, and it will take on a dingy color as it wears off naturally over time. Identify it by turning the branch upside-down and looking at the underside of the needles. The insect itself has a white, wooly appearance, but it differs from Wooly Adelgid because it is on the needles rather than the twig. Identified by performing a “tap test” – hold a piece of white paper under a branch and tap it, then rub your hand across the paper and look for the mite blood smears. They feed on chlorophyll, which can cause the trees to take on a light green or tannish brown color (“bronzing”). They feed on the underside of leaves of plants, which can pose a challenge when spraying for them. One of our go-to suppression solutions this year is Horticultural Oil. You may have already heard of it, and you might be wondering what it is and how it works. It is a natural material that can be used on a wide variety of plant material to control an equally wide variety of insects. Horticultural oil is a safe alternative to some of the harsher insecticides with the added benefit that it is “easy” on beneficial insects. We apply Horticultural Oil from early spring well into the fall – the “growing” season – depending on the specific insect that we’re targeting. It is applied to the foliage as a spray, and – as we saw with the spider mites – it is important to get as much of the surface area of the plant material as possible (even under the leaves). During the fall months, it is a good way to clean the plants up and get them ready for winter. As we discussed previously on this blog, this summer’s record rainfall led to us getting lots of calls about leaf blight and trees that were dropping their leaves prematurely. If the trees have managed to keep enough of their leaves and perform photosynthesis well enough to make it through September, then they likely have enough energy stored up to survive the winter and come back in okay condition next spring. However, they might be more susceptible to leaf blight in the future and several consecutive seasons of leaf blight could potentially damage the tree beyond saving. The first step is to fertilize. A blighted tree has spent a large portion of this summer with an impaired ability to perform photosynthesis, which is a major stress factor for tree health. Fertilization injections can provide some of those missing nutrients to form a nice crop of foliage next year. We can come out and do soil tests to identify which nutrients your tree might be lacking and prescribe a tailored nutrient package based on those results. The second step is to keep on top of your leaf clean up. 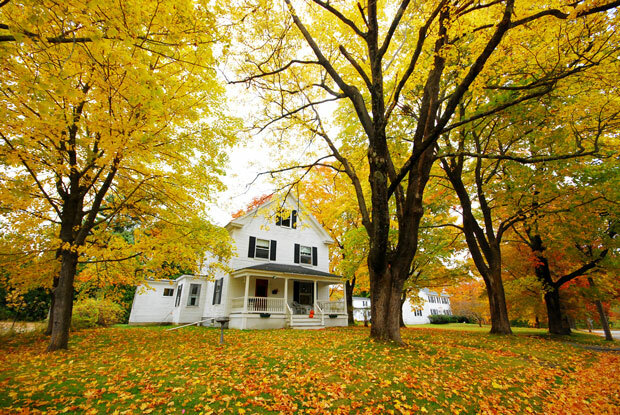 One of our recommendations is to clean up as many of the fallen leaves as you can. Leaves that left on the ground will serve as an inoculum that leads to an abundance of fungal spores. However, leaf blight is an easily spreadable fungus, so if your neighbors aren’t as dedicated, you might still encounter the blight next spring. The third step is to protect the new crop of leaves in the spring. Spraying for leaf blight is most effective in the springtime on a preventative schedule. Depending on the species of tree and the specific leaf disease or fungus, you’re most likely looking at two sprays minimum. Three-to-four sprays isn’t uncommon. This year would have required a fairly aggressive spraying regimen to stay on top of things. Hopefully next year will be a bit dryer. The unusually high amount of moisture this year uncovered a lot of plant health issues that normally fly under the radar. Whether the problems are unexpected tree failures or leaf blights or seasonal insects, now is a good time to talk to us while the symptoms are present. If your leaves are discolored and dropping prematurely, we can come out and let you know if it’s because of fungal leaf blight, girdling roots, “mulch volcanoes” or an invasive insect. If you’re experiencing these or any other tree or plant health concerns give us a call. If you wait until spring, it may be harder to diagnose the health problem, so now is the time to identify and treat potential problems.